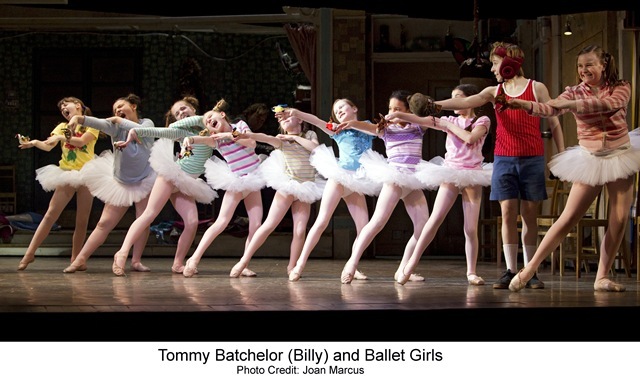 Exciting video of opening night of the Chicago version of Billy Elliot. After four Laurence Olivier Awards, ten Tony Awards and ten Drama Desk Awards, you don’t need me to tell you that Billy Elliot: The Musical is worth seeing. Time Magazine also named it the "Best musical of the decade," an assessment I don’t agree with — my vote goes to Urinetown — but I will say Billy Elliot has everything a good musical ought to have: Fine music, outstanding choreography and a heartwarming, if clichéd, story full of triumphs and pathos. Having opened in London in 2005 and on Broadway in 2008, the acclaimed musical has finally come to Chicago, where a stellar cast does it full justice. Based on Lee Hall’s screenplay for the 2000 film, the plot is one we’ve seen many times before — a talented youth, dancing to his own drummer, beats the odds and makes doubters accept him on his own terms. 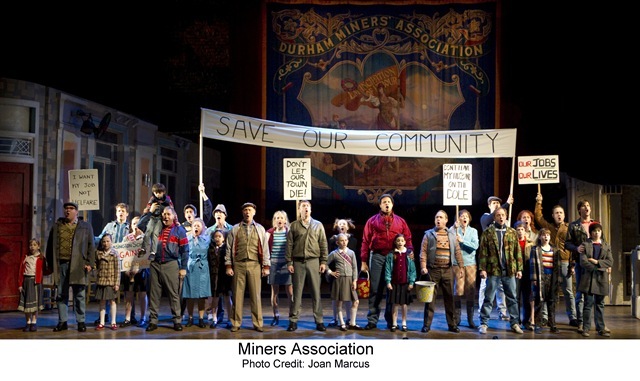 In this case, it’s 11-year-old Billy Elliot, son of a British miner, amid the devastating 1984 Coal War in which labor lost its fight against Margaret Thatcher’s conservative government, destroying the miners’ union and all but ending coal mining in the U.K. Billy’s mother is dead; his grandmother is senile; his dad and older brother, Tony, are on strike, along with most of the men in their town; money is short and tempers are flaring. Sent to boxing class, Billy accidentally stumbles into a girls’ ballet lesson and discovers a love and talent for dancing — outraging the men in his life. It’s a rollercoaster of a story, full of contrasts, at turns funny and sad, raucous and refined, exultant and despondent. Politics, class consciousness, the role of the arts vs. sports, sexual identity all come together, sometimes clashingly. If the bitter defeat of the strike seems an odd match for the bright jubilation of Billy’s triumph, well … it’s a musical. Peter Darling’s dazzling choreography makes the most of the juxtapositions, as in the brilliantly effective sequences of warring police and angry strikers interspersed with little girls in tutus. Performed by a first-rate orchestra, led by Colin Welford, Elton John’s score, with lyrics by Hall, also brings us some startling contrasts. It runs the gamut from cheerful music-hall ditties to rousing anthems to sad ballads, from joyous to silly to angry, sometimes even in the same song. In an excellent example, one of the few solos, "We’d Go Dancing," Billy’s grandmother — a splendid performance by Cynthia Darlow — recalls her unhappy married life. On the silly side, we get "Expressing Yourself," a strange sequence in which Billy and his transvestite friend, Michael (played alternately by Keean Johnson and Gabriel Rush), don women’s clothes and then dance with giant headless dresses. Then there’s the pure joy of "Electricity," Billy’s paean to dancing. A rotating cast of four boys plays Billy. 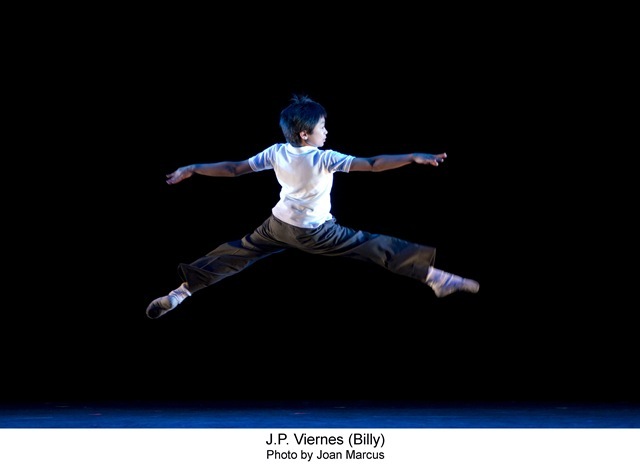 On opening night, 13-year-old Cesar Corrales showed dazzling talent as a dancer and actor. A breathtaking pas de deux with his older self (onetime Joffrey dancer Samuel Pergande) deservedly drew a standing ovation on opening night. We also see excellent moves from Emily Skinner as Mrs. Wilkinson, Billy’s pushy ballet teacher, and Blake Hammond as Mr. Braithwaite, her grotty accompanist. No one in this ensemble puts a foot wrong. This musical contains adult language some parents may consider unsuitable for children. 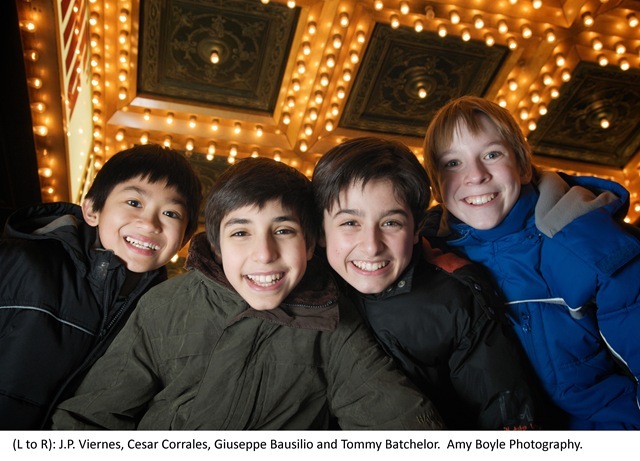 This first Billy Elliot webisode features interviews with Elton John (music), Stephen Daldry (director) and the four young stars rotating in the role of ‘Billy’ – Tommy Batchelor, Giuseppe Bausilio, Cesar Corrales and JP Viernes. Find out why the producers chose Chicago for the first U.S. production outside of Broadway and what makes Chicago such an incredible city for live theatre. Additional webisodes will be released in March and April to introduce the cast, explore rehearsals, audience reactions, opening night and more, giving viewers around the world a chance to connect with this hit musical as it begins its run in Chicago. A five minute feature about Billy Elliot the Musical auditions. Billy Elliot fans will have seen most of this video before. However, this version includes a few brief shots of the new Chicago Billys: Cesar Corrales, Tommy Batchelor and Giuseppe Bausilio at 1:20, 2:57 and 4:04. One of the 4 Billys in the Chicago production, this clip shows Giuseppe Bausilio’ early dancing talents at his parent’s ballet school, Tanz Ballet Pirouette – Bern, Switzerland. Billy Elliot will begin preview performances March 18, 2010 at the Ford Center for the Performing Arts, Oriental Theatre (24 W. Randolph St.). Opening night is Sunday, April 11, 2010. 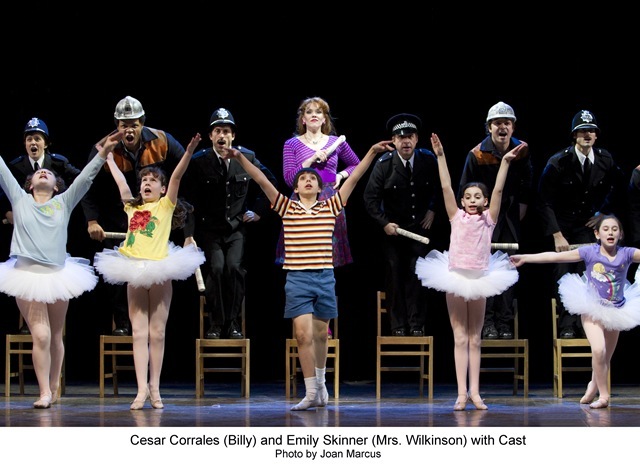 Time Magazine recently named Billy Elliot the “BEST MUSICAL OF THE DECADE.” This incredible honor adds to the show’s overwhelming acclaim and recognition that includes ten 2009 Tony Awards®, including Best Musical, as well as Best Musical awards from the NY Drama Critics Circle, Drama Desk, Outer Critics Circle and Drama League. Billy Elliot is the funny, heartwarming tale of a young boy with a dream, and a celebration of his triumph against the odds. Set against the historic British miners’ strike of the 1980s, the story follows Billy’s journey as a boy in a small mining town who, after stumbling across a ballet class while on his way to a boxing lesson, realizes that his future lay not in the boxing ring but on stage as a dancer. Featuring music by Elton John, book and lyrics by Lee Hall, choreographed by Peter Darling and directed by Stephen Daldry, Billy Elliot opened to critical acclaim at Broadway’s Imperial Theatre on November 13, 2008. Billy Elliot the Musical is produced by Tim Bevan, Eric Fellner, Jon Finn and Sally Greene. Angela Morrison and David Furnish are Executive Producers. The production features scenic design by Ian MacNeil, costume design by Nicky Gillibrand, lighting design by Rick Fisher and sound design by Paul Arditti. Musical supervision and orchestrations are by Martin Koch. Individual tickets range in price from $28 to $100. A select number of premium seats are also available. Tickets are available at all Broadway In Chicago Box Offices (24 W. Randolph St., 151 W. Randolph St. and 18 W. Monroe St.), the Broadway In Chicago Ticket Line at (800) 775-2000, all Ticketmaster retail locations (including Hot Tix and select Carson Pirie Scott, Coconuts and fye stores) and online at http://www.BroadwayInChicago.com. For groups of 15 or more, call (312) 977-1710. Theater critic Paige Listerud (far right) with J.P. Viernes (playing Billy Elliot) and his parents. The Viernes family is from California. Blog’s founder/editor Scotty Zacher with Billy Elliot (a.k.a. J.P Viernes). J.P. is one of 4 Billy’s, rotating throughout the week. Theater critic Paige Listerud, with Patrick Mulvey, who plays Billy Elliot’s older brother in all 8 performances each week.